JCU researchers have teamed up with US Special Operations Command to develop a life-saving drug for soldiers. US Special Forces are funding a world first, breakthrough drug therapy for treating battle casualties that’s being developed by James Cook University scientists in Australia . 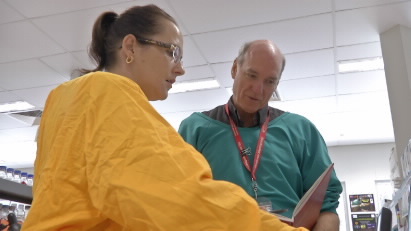 The US Special Operations Command (SOCOM) is providing $550,000 to fund work by Professor Geoffrey Dobson and Research Associate Hayley Letson from JCU’s Division of Tropical Health and Medicine. The drug therapy they’re working on may be the first big advance in treating battlefield casualties since the Vietnam War. Dr Dobson said SOCOM became involved because of the progress the JCU team had made over seven years developing the process. Dr Dobson said the treatment targets what battlefield surgeons call the “platinum ten minut es” after a soldier is wounded . He said the better known “golden hour” is a meaningless concept in far-forward military environments. “During the fighting in Iraq and Afghanistan, more than 87 percent of all deaths among allied soldiers occurred in the first 30 minutes, before they could get to a hospital. Nearly a quarter of these, almost a thousand people, were classified as having potentially survivable wounds. Time was the killer,” he said. “The problem is, after a soldier suffers catastrophic blood loss and brain injury, what is a good treatment for the body is not good for the brain and vice versa,” said Dr Dobson. The JCU team is developing a two-stage treatment. The first shot will rescue the casualty during the first few minutes of severe haemorrhage and head trauma. The second shot is designed to stabilise them for longer periods ahead of evacuation. “The fluid can be administered quickly into the blood or bone marrow and it also reduces inflammation, coagulopathy (the bloods inability to clot) and whole body energy consumption,” Dr Dobson said. The treatment aims to gently raise the heart and blood pressure into a “survival window” that is low enough to reduce further blood loss, but high enough to prevent further brain injury. Dr Dobson says the benefits won’t be limited to US SEALs and commandos, but will automatically flow through to other western Special Forces units because of the close contact and co-operation between the organisations. The treatment could also be used to save lives away from the battlefield. Because the extreme environments in which Special Forces soldiers operate share many similarities with tropical, rural and remote environments, the JCU work has relevance to pre-hospital medicine and aeromedical transport in many regions around the world.